We love hearing from our clients! Here are some of our favorites. I have to say that YOU are the reason I am signing up for the [Dirt Devil Racing] series. I visited you back in 2011 for a mysterious and debilitating pain that ended up being a correct diagnosis of micro tears in my soleus. The exercises, warm ups, and care you prescribed were the reason I was able to complete my training for the 2012 Big Sur marathon and the reason I was able to complete the race (my first)!!! I couldn’t be more appreciative of the information and confidence you gave me that made it possible for me to continue running. I’m so glad I didn’t visit my primary care doctor (that doesn’t run), or worse yet – give up! To Dr. Allen: Ankle healed 100 percent! You are the best! Thank you! I am so grateful for your diagnosis, help and guidance! I’m so excited to share with you that I finished my first half Ironman!!! I am not overly excited about my run time, however, I am ecstatic to report that I was able to finish the half marathon part of the race without stressing about reinjuring or doing further damage to my femur! Race day dawned with anxiety and excitement! The swim was cold but awesome! I expected about 2000ft of elevation gain on the bike but someone, somewhere had a ‘broke’ GPS unit because we ended up climbing more than 3200ft!! That same ‘broke’ GPS unit said we would only climb 400ft on the run but we climbed over 1300ft! Having not run for over 3 months and facing hill after hill, lets just say it was difficult :). I walked up the hills and ran down the other side, walk/ran the 3/3 on the flats and just had fun out there.. I woke up the next morning barely able to walk! The muscle soreness in my legs was incredible. I have really tried to pinpoint where the pain is, might take a few more day for it to subside a bit more, but I don’t believe it’s coming from the femur area. I am so grateful for your diagnosis, help and guidance! I’m pretty sure all the other doctors would still be “fixing” my ITBand and back issues ;0). Your explanations were easy for me to follow and understand. Your advice for getting back on the run has helped tremendously! Not a THANK YOU big enough to give you but thank you anyway. Do I consider my leg fully healed and jump right back into the running? Should I continue to do the run/walk? And if so for how long? Should i come back in to see you? I’m a little uncertain how to continue forward, any advice or guidance you can give would be very welcome. From the minute you meet him, you know he is a doctor that cares about his patients! As a dispatcher, I have had neck and shoulder problems for years. During this time I have gone to other chiropractors all of whom did “crack” adjustments. My pain rarely went away and I was told it was because I did not come 3 times a week or take a multitude of vitamins they sell. Then I saw Dr. Allen and was amazed at my experience. I love walking in for an appointment and the fact that the office staff knows everyone by name. It makes you feel special! Dr. Allen builds a climate of trust right off the bat. He is very thorough in his explanation of what is happening to your body. He treats with heat and stem to relax the area prior to working on it. If there is a day I am in pain, all I have to do is call and he will always try to get you in. From the minute you meet him, you know he is a doctor that cares about his patients! I highly recommend him to anyone looking a a chiropractor! I came into your office in September, and you really helped me with the problems I was having with my left foot. I could barely walk, let alone run. It is so much better now, and I am so grateful for your help and expertise. You made me some orthotics, told me to stretch every waking hour, and said It would take about 2 months for it to heal. You were exactly right! Two months later, I was back out running 3 days a week, and almost 3 months later I’m up to 10 miles again on my long runs, and getting ready for the Wild Horse Half. My daughter also came in with some back issues, and is doing better too, and feels like she has some solutions. Thanks for what you do, I feel so grateful to have found you! Dr. Allen completely personalized his treatment and prescription of therapy for me based on my lifestyle and activities. I have been treated by Dr. Allen for the last two years or so for various injuries, and every time I saw him he had me back to 100% within 2-3 visits depending on the injury. The fact that he treated me for my injury in only 2-3 visits is incredible considering previous chiropractors had me coming back every other day for weeks, and still didn’t have me completely healed. From my personal experience, Dr. Allen completely personalized his treatment and prescription of therapy for me based on my lifestyle and activities. Which lets me know that he treats every one of his patients individually and puts tremendous effort into each one of his patients. From the first time he treated me I have been extremely comfortable with Dr. Allen, and he has made himself available to me whenever I have needed him. I am not usually the type to write a review about someone, but I know how difficult and frustrating it is to find a good DC who can understand your injury and get you back to 100% as soon as possible. Dr. Allen has a very good philosophy and approach to treating each one of his patients and I obviously recommend him to anyone. I am finally headed down the road I wanted to go. I just have to email you now because I don’t want to wait to tell you the good news at my recheck. First off, you should know who I am. My name is Shawna and you saw me last week because of a “bum” knee. You gave me a shoe lift and sent me on my way to see how it worked and if I could run without pain. Well, did you know that I had a love/hate relationship with running that even I did not fully appreciate until this week? I need to run, I am a mess if I don’t at least get a couple of good runs in a week, but it is always hard to make myself go. I thought it was because I was lazy, or that running was work, but I don’t think that at all now. I think it was because there was always some amount of pain involved, and I knew it, even if at times it was on a semiconscious level. This week I ran with almost no pain. And not only was it easy/comfortable to run, the next day I was eager for more!!! I had tried the super foot in one shoe as I had told you, and it was no where near the same as what I have now. I actually like running! Not just how I feel after, but the ACT of running! You gave that to me, this week, You made me see where I was, how I had been, and you have given me some semblance of symmetry- you have given my knees a break from the grating and grinding that I put them through ( always hoping that some how my legs would just fix themselves). I have been running for 6 years with one type of knee pain or another on a regular basis, always defending that running doesn’t hurt our knees, that it is HOW we run, and our imbalances/weaknesses that hurt our joints. I knew that I was a statistic, and it took a dnf, a good friend (and awesome example) and a doctor who I knew wanted me to keep running, to guide me to pain free running, Today I did woodson- 27.4 miles. I had some twinges of the previous injury, but I didn’t have to run through it, I gave it time and it went away, THANK YOU THANK YOU THANK YOU!!!!!!!!!!!!!!!!!!!!!!!!!!!!!!!!!! My knee won’t be swollen tomorrow. I will not be afraid to try for 40 miles this week and 3 days at crossfit. I am finally headed down the road I wanted to go. Thank you again, you’re a Godsend. … a very happy runner!!!!! I won my age group in the 5K on Thanksgiving and my running is much less painful that it has been for a LONG time. So I just wanted to say thank you very much. The pain I have had my right foot and right calf is not nonexistent, but real close to it. It is amazing what a difference you have made and I just wanted to thank you. The care and treatment that I received by Dr. Allen was outstanding. In November of 2008 I was involved in a car accident. I went to see Dr. Bruce Allen at SDRI because I was experiencing pain in my neck. back and right shoulder. The care and treatment that I received by Dr. Allen was outstanding. Dr. Allen got me in right away and did a thorough examination to determine the extent of my injuries and to insure that I received the proper treatment in my recovery process. In addition to being extremely informative and personable, Dr. Allen takes the time to explain in thorough detail his diagnosis, treatment and recovery process. In addition, he also gave me exercises to do at home to help my injuries and was very flexible to accommodate my schedule when making appointments. In addition to helping my whiplash and next injuries, Dr. Allen also referred to me a great surgeon for my shoulder and kept in contact with me after my treatment at his office was complete to make sure that everything was alright. Dr. Allen is a great doctor who helped me not only with my injuries but with my rehabilitation. Dr. Allen is honest, trustworthy, loyal and a caring doctor who puts his patients first and truly cares about their well being even after their treatment is over. I continue to use Dr. Allen and always will. I refer Dr. Allen and SDRI to all my family and friends. The office staff is phenomenal as well. Becky and Krista assisted me with insurance and any questions that I had. They were patient, understanding and so friendly. I highly recommend San Diego Running Institute for any Chiropractic needs. I have been to see Dr Allen several times. He is thorough, professional, and explains the injury in laymans terms. He has used multiple forms of treatment which my injuries have responded very well. I have never had to wait more than 5 minutes once i have checked in with the receptionist. One of the most significant reasons I recommend Dr. Allen is he doesn’t tell you that you need to see him 3x a week for 6 months, as some DC’s. Dr. Allen’s manner and treatment approach are great. Recently I suffered from a running injury. Dr Allen led my recovery so that I returned to my usual running routine in a short time, without invasive methods. I’m an older runner who ahs been running for about 45 years. I was at 3-4 miles at a frequency of 3-5 times a week. In late Spring of this year, I started noticing some minor pain on the underside of my right foot, just under the fourth toe joint. Briefly, I tried the usual (changed my shoes, added some gel soles, talked to other runners, reduced my running, took naprosyn, used hot foot baths, etc.) with minimal success. The condition became increasingly worse (increased pain and swelling of the foot and the toe):the condition got the point of being uncomfortable even to walk, especially barefoot on hardwood floors. So, you’re probably wondering why I hadn’t gone to one of the clinics in San Diego. I had had a similar condition in a different toe about 10 years ago and was told I had Morton’s neuroma. After receiving steroid injections and some other treatments, the condition still didn’t demonstrate improvement . I was told I would need surgery, which I said was a “no go”. I was also told I might have arthritis. I stopped running, and changed my work/walking shoes. The condition got better after several months of not running. That toe has not bothered me since and I have no sign of arthritis as of my last physical. Finally in May I tried acupuncture, which relieved some of the pain, but the condition would return in a day or so. My acupuncturist told me about Dr. Allen. Dr. Allen treats a lot of running injuries and (importantly) is a long distance runner (so he understand the psyche of runners). Dr. Allens manner and treatment approach are great. On my first visit in late June, he explained what had happened (I had a sprained plantar plate; he gave me a diagram of the foot and circled where the injury was), showed me a model of the area, and clearly explained why there was pain/swelling of the foot and toe. If I had let it go, I could have torn the ligament, which would have been really bad. This condition is a common running injury and often is not treated efficiently or effectively. He clearly wrote (much appreciated) out the course of treatment (non-invasive! ), said how long I would probably be at each stage (with an explanation of what was happening in the healing process: all very logical) and when I could start running again. I was able to walk and perform daily routines with the help of a walking boot until I was ready to go to the next stage. I graduated to metatarsal supports after a while. At about 8 weeks, I started long walks with metatarsal supports. I started running again in September and I’m back to running my usual routine in October. What impressed me with Dr. Allen’s approach is 1) his knowledge of the running injury treatment, 2) his patience with questions and 3) his ability to explain both the injury and the treatment. It helps a lot that he has a runner’s point of view. He had the improvement timing down pat. He adds a very personal manner to his practice: one out of many examples is that he personally took the time to add metatarsal supports to my shoes, rather than delegate. In short, I can only express my sincerest thanks to Dr. Allen for his skill with which he has allowed me to run again. Something I always noticed about Dr. Allen was his genuine concern for his patients and committment to helping them feel better. Not only is he a very skilled physician, but a caring one, as well. I recently stopped in to buy a pair of shoes to replace my Nike 2:40 Airs. I **loved** my Nikes. I think I like my new shoes even more. They are a brand I have never heard of that begins with an M. What I definitely love even more is the level of service I received from start to finish from your store employees/ partners/ associates/ or whatever the proper term is. I crew for the AVON walks every year AND I walk at least 45 miles a week, so comfortable shoes are a top priority for me. I was very dissatisfied with the treatment I got at Footlocker when I bought my ($120) Nikes, and that made my experience all the more wonderful when Amanda took the time to make me feel comfortable and welcome, rather than simply another random person to sell shoes to. Believe me. I am no Hollywood movie star, so I am used to reluctant assistance from retail sales people. Amanda’s caring professionalism was the antithesis of the usual treatment I receive. Given the fact that I will most likely never meet her again, it is imperative (to me) to ensure that her value as a retail representative of your organization goes noticed. Thank you for a great shoe-buying experience. I will keep your business card and hen next I need athletic shoes I will do my best to stop in, and I *certainly* will highly recommend your store and staff. Just remember what great people you have working with you, lest they slip away. Dr. Bruce Allen is not only knowledgeable and competent, but his ethical approach is second to none. Not only can I expect solid results from his services, but I can also expect a full explanation as to the cause of my injury and what is being done to remedy it. His skills are supplemented by his personable attitude and professionalism, which make business with Dr. Allen a pleasure. I was having a painful foot problem that bothered me constantly. A friend recommended Dr. Allen so I gave him a try. He clearly explained the situation and prescribed orthotics for my shoes. I was custom fixed and now I’m pain free and I’m back to enjoying all my activities. I can’t believe the difference. I highly recommend him. Its me Dillon B you know Tina B’s son the kid who had the gastroc thing injury. Yeah, I would just like to inform you that the rest of my cross country season was horrible after that injury, but…….. my track season was fantastic!!!! beginning of the season was 12:03 and my mile time was 6:15 but by the end of the season at league final my two mile time was 10:46 and my mile time was 4:56. I got fifth in the two medal (got some bling) and seventh in the mile (was 4th till the last 40 yards) but I did great. 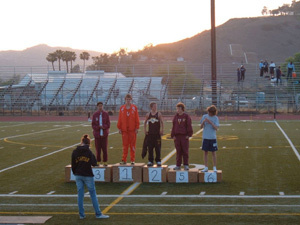 Attached are three pictures 1 at a dual meet at MV (the Dirt track) and 2 from league (one running look for maroon and long hair and one on the winners thing) I also recently at the first XC invitational of the season at west hills I got 12:23 on a 2.1 mile course and got 12th (more bling) with my time I made Fifth man Varsity. I really appreciated how he took the time to explain to me how each procedure would feel. I went to see Dr. Allen because my right hand became numb whenever I did certain activities such as driving a car, working on my computer, or working out. I thought I needed carpal tunnel surgery to correct the problem. Dr. Allen performed many tests and diagnosed my problem, not as carpal tunnel syndrome, but as a nerve impingement syndrome in my right shoulder. He explained the treatment I would need and gave me various exercises to do on my own. I went in for treatments twice a week for a three week period. My treatments consisted of Ultra Sound, Electrical stimulation, hot packs, kinesio-taping, deep tissue work and various adjustments. Dr. Allen focused only on my impacted area and indicated there was no need to work on any other area. After the three week treatment period the numbness in my hand improved dramatically and my shoulder felt great. During each session, I really appreciated how he took the time to explain to me how each procedure would feel. I came away with an even greater appreciation for Dr. Allen and the methods he uses to treat his patients. Thanks to all of you I was able to achieve a second place finish in my division at the Imperial Beach duathlon (8/07). I am so pleased! I have had knee pain for many years now and been to many different medical professionals for treatment. None of these doctors were able to give me any relief until I found Dr. Allen. His treatment methods exceeded even my expectations. He was very knowledgeable in explaining my diagnosis and the treatment that would be necessary in order to get rid of my pain. I am now able to walk again pain free. Thank you for all of your help. He listens to your needs and takes great care of you. I have known Dr. Allen for a very long time. As soon as I heard the great news that he was going into the Chiropractic field I was very excited. I have had these on going headaches and I was tired of taking medication for them. I also had back pain and was concerned about my poor posture. Dr. Allen is incredible. He taught me how to work on my posture though a custom exercise regiment that was tailored for my needs. I was only in San Diego for about 5 months visiting and went to see Dr. Allen for adjustments periodically during my stay. It has been great. I have no more headaches and by doing the stretches the he recommended I have not had any pain. If I was in San Diego still I would be there to see him. When I do return to visit I plan on stopping by for a maintenance adjustment. I highly recommend his work. He listens to your needs and takes great care of you. If you have any problems big or small Dr. Allen is the Chiropractor you can trust. Gina, I am writing you to express my appreciation. I came in last week to be fitted with the correct running shoes and you spent quite a bit of time to take foot measurements and analyze my gait on the treadmill. I consider the service I received to be professional and well informed. Thank you so much. I’m fired up & very happy I found you. Because Southern California is a mecca for athletes, it goes without saying that ads for chiropractors and athletic injury specialists are all over the place in LA and San Diego. That makes choosing the right doctor kind of crapshoot. I’m a triathlete, and at age 41, I had the first knee injury in my life. A knee injury for the sedentary is a mentally bad thing, but a knee injury for a runner is even worse. 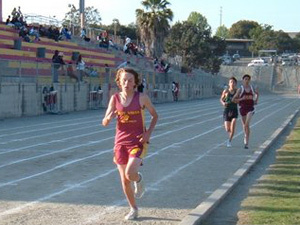 Getting taken out of running at this age had me extremely concerned about what that would mean when I get older. I tried a bunch of chiros, but my primary dissatisfaction was that as good as they might be at adjustments, they weren’t runners, and thus, the focus was on getting me walking again, but not necessarily competitive. Knee injuries are tough things to diagnose; I needed someone who was not only a chiro/injury specialist, but an athlete – someone who would understand the competitive drive to be out there running, swimming, biking as soon as possible. After nine months of struggling with this injury I came across your ad in Competitor. You not only isolated & diagnosed MCL injury right away, but you emphasized using any and all techniques (chiro, acupuncture, ultrasound, EMI, and other non traditional Asian methods) to heal it, with surgery only as the absolute last resort. No athlete in his right mind wants to undergo surgery if there’ a more holistic option that works. After a mere 4 weeks of therapy, I was on the treadmill, and 2 weeks later, I was out on the blacktop again, running the bluffs in North County and happy as hell to be out there again. I’m fired up & very happy I found you. Your staff (the Kristas –squared) was extremely courteous & knowledgeable and you are very educational about what each therapy is intended to do. I’ll be recommending any other athletes to you in a heartbeat. Thanks to your “blister clinic” I was able to actually finish this event. I wanted to write and say thank you. I just finished the three day yesterday and thanks to your “blister clinic” I was able to actually finish this event. Blisters? Oh yes, we are old friends now! Something you said in passing stuck with me and I tried it and wow! What a difference! I had four bad blisters and dug first into my sewing kit. I grabbed a needle threaded with white thread (I thought the dyes may have bad something in them). I took an alcohol swap and ran it over the needle then down the thread. I then ran it through the edges, in one side and out the other, leaving about ½ inch on each side. I slapped some 2nd Skin on it and wrapped with Kinesio tape and the blisters gave me no trouble at all! Unfortunately my knee gave out completely going from the holding area to the closing ceremonies, but I was caught and with a great deal of help I was able to “walk” to the ceremonies. After looking at the principles of this tape I have to wonder if there is a way to use it to reinforce my knee, but that is another subject all together. I am definitely a Kinesio convert! I even helped a lady who needed some “moleskin” she said. I taped her up with some 2nd skin and moleskin and she took off. I never saw her again! LOL! I guess it worked well! I used it on my wife when she started feeling hotspots too and it kept her from getting blisters. All in all, I think this stuff is wonderful! I am walking again next year (as soon as I can get this knee to heal we’ll start training) and I will be by to order some more tape and second skin! I want to thank you and SDRI for teaching me how to run…correctly! Who knew I’d been doing it wrong all these years and years. I no longer get neck strain, pain in my low back or pain in my right knee. I can also run further with more energy and no injury. It’s amazing what a difference it makes after correcting my posture, my gait, arm motion, using the right shoes and even the right sock. You changed my life. Thank you. Thank you so much for finding the perfect running shoe for me! The expertise you offered allowed me to train for my first half marathon without any foot problems/injuryies whatsoever. The pair of shoes you chose for me have performed beyond by greatest expectations. I can’t wait for my next race! Thank you so much! I’m really thrilled with the progress I’ve made. After gait sessions with Gina, Bob B wrote; “I actually ran better than I thought I would today. On the three mile effort, the miles went 6:39, 8:16, 6:34. The second was a little slower than it probably should have been, but not too bad. I died on the last quarter of the last mile. I was actually on about a 6:15 pace up until then. I also did some strides afterward – just for mechanics sake.